How to calculate sinh, cosh, and tanh? Whether you are a high school student or a proficient mathematician, you will surely find this hyperbolic functions calculator useful. It is a tool that computes the values of six basic hyperbolic functions - sinh, cosh, tanh, coth, sech and csch - all in a blink of an eye. You can also use it to calculate the inverse hyperbolic functions. Hyperbolic functions are analogical to trigonometric functions that you probably know already, such as sine or cosine. What's the difference, then? If you plot points with coordinates (cos x, sin x) in a Cartesian coordinate system, they will form a circle. But if you plot points with coordinates (cosh x, sinh x), they will form a hyperbola. All of these functions can be defined in terms of exponential functions. If you're not sure what these are, head to our exponent calculator for more detailed explanation. 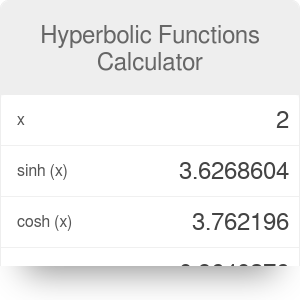 Our hyperbolic functions calculator is also able to find the values of inverse hyperbolic functions. All you have to do is input the value of one of the functions (for example, sinh(x) or tanh(x)), and this tool will automatically return the value of x. The formulas used to compute inverse hyperbolic functions are shown below. Hyperbolic Functions Calculator can be embedded on your website to enrich the content you wrote and make it easier for your visitors to understand your message.